A contact mode atomic force microscopic (c-AFM) study has been carried out to realize the high fidelity of a nanomolding process where nanostructures fabricated on a silicon master are replicated onto an aluminum surface. The AFM images of the nanostructures show systematic artifacts due to the finite size of the AFM tip and thus set a limitation to the estimation in the fidelity of the nanomolding process. The quantitative analysis presented in this letter enables to extract the parameters necessary to reveal the high fidelity of the nanomolding process while the real width and the depth of the nanostructures are still unknown. This work provides a direction to the researches in the field of atomic force microscopy of nanostructures to analyze the data accurately in presence of systematic artifacts. Fabrication of nanostructured materials is the key factor in nanotechnological researches [1,2]. Different nanofabrication processes [3-6] with its own advantages and limitations have been realized for various applications. A high-speed electrochemical nanomolding process  has been introduced recently to replicate nanostructures of different shapes and dimensions from a silicon (Si) surface onto an aluminum (Al) surfaces. The high fidelity of this nanomolding process has been demonstrated by replicating a smooth Al surface with rms roughness less than one nanometer . Here, in this letter, I have studied the high fidelity of the nanomolding process by atomic force microscopic (AFM) characterization of the nanostructures molded from the Si master. Although AFM  is employed to characterize a wide range of samples [10-12] with accuracy less than one nanometer particularly in the depth measurement [13,14] this nondestructive method suffers from systematic artifacts [15,16] severely while scanning high aspect ratio nanostructures. The artifacts caused by the finite size of the AFM tip set limitation to the characterization process. In general, AFM images show accurate lateral and vertical dimensions of a nanostructure with vertical sensitivity higher than the lateral one provided the tip reaches the bottom of the structure. The quantitative measurement of the nanostructure dimensions reveals the high fidelity of the nanomolding process while the real dimensions of the nanostructures are still unknown. This letter demonstrates a method to extract the necessary information from an AFM image with systematic artifacts which can be employed successfully in regular nanotechnological observations. The electrochemical nano-molding process has been described in details elsewhere  and is presented schematically in Figure 1. In brief, an n-type Si (100) sample with low resistivity (0.0015 Ohm-cm) is used as a substrate for master mold. A nanostructure is fabricated on the Si substrate by FIB or E-beam lithography. Then the Si mold is used as the cathode in the subsequent electro-deposition of aluminum (Al). Electro-deposition of Al was carried out in a glove box with nitrogen ambient. 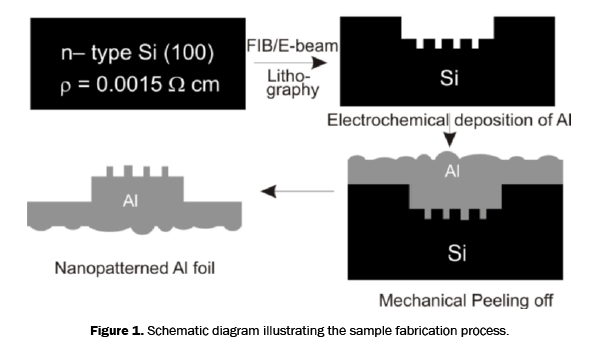 Al deposition on the nanostructured Si mold forms a thick Al foil which can be peeled off the Si mold mechanically due to the tunable adhesion of Si and Al . The peeled off Al foil shows the nanostructures molded from the Si master with the shape and size as preserved. Figure 1: Schematic diagram illustrating the sample fabrication process. All the measurements were carried out by contact-mode AFM (Digital Instruments’ Nanoscope). To test the fidelity of the molding technique, I electrodeposited Al onto a Si mold that has been patterned by focused ion beam (FIB) lithography. Line gratings with 100 nm period were delineated as the master nanostructures on the Si surface by 30 keV Ga-FIB with 10 pA beam current. Figure 2 presents the AFM image of the aluminum foil peeled off the Si master. It portrays the smooth surface of Al with rms roughness of 1 nm. The smooth surface of molded Al is the evidence of high fidelity nanomolding process since the surface smoothness of Si master has been transferred to the molded surface directly. This result corroborates the high fidelity of nanomolding process for flat surfaces. Figure 2: Top-view AFM image of Al substrate. A nanostructure was fabricated on Si master and molded to verify that the high fidelity of the process is similarly applicable to the nanostructured surfaces. A line grating on Si master was delineated for this purpose and molded following the process shown in Figure 1. Figure 3a shows the AFM image (3D plot) of the gratings on Si master while Figure 3b illustrates the magnified AFM image of an area, as marked by the white square, and the corresponding height profile of the line gratings. 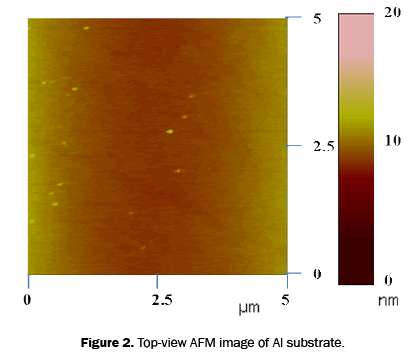 Figure 3c presents the AFM image of the molded Al surface, showing the nanopattern from the Si master has been transferred onto the Al. Figure 3d illustrates the magnified AFM image of an area, as marked by the black square, and the corresponding height profile of the line gratings. Typical height profiles of pristine Si mold and the molded Al foil are also included in Figures 3b and 3d respectively to represent the smoothness of both surfaces quantitatively which show mutual agreement. It suggests that the rms surface roughness of pristine Si mold has been truthfully replicated on the molded Al foil. The general features shown in Figure 3 qualitatively demonstrate the high quality of the nanomolding process. 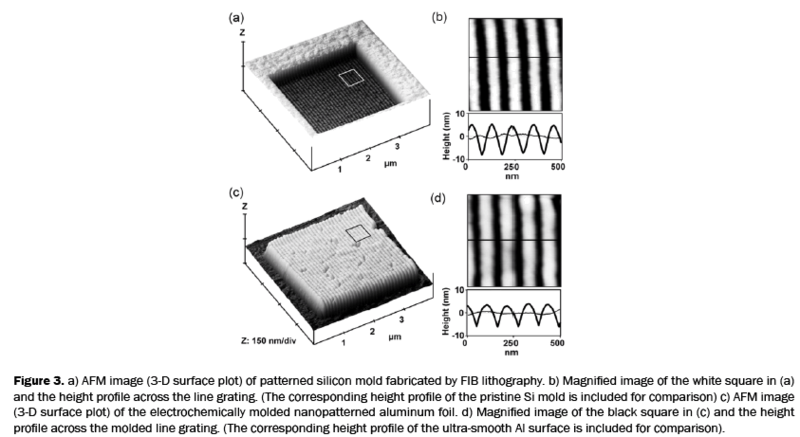 Figure 3: a) AFM image (3-D surface plot) of patterned silicon mold fabricated by FIB lithography. b) Magnified image of the white square in (a) and the height profile across the line grating. (The corresponding height profile of the pristine Si mold is included for comparison) c) AFM image (3-D surface plot) of the electrochemically molded nanopatterned aluminum foil. d) Magnified image of the black square in (c) and the height profile across the molded line grating. (The corresponding height profile of the ultra-smooth Al surface is included for comparison). Quantitatively, the 100 nm periodicity of the gratings on the Si master had been molded truthfully on the Al foil as shown by the height profile in Figure 3d. But the width and depth of the replicated line gratings appear to be slightly different from that of the mold. Careful observations on the height profiles reveal that the crest is u-shape in Figure 3b while it is v-shape in Figure 3d. This observation hints that AFM tip fails to reach the bottom of the crest in the molded sample portraying the v-shape crest in the height profile. The apparent discrepancy related to the width and depth of the nanostructure is thus a systematic artifact caused by the finite size of the AFM tip and can be well explained with the help of the schematic diagram shown in Figure 4. Figure 4: Schematic diagram illustrating the systematic artifacts in the height profiles of Figure 3 caused by the finite size of the AFM tip. As the AFM tip is scanned across the master and molded gratings, the shape of its apex convolutes with the protrusions of the grating to create the convex part of height profile. When it reaches the troughs of the gratings, the finite size of its shank prevents it from reaching the bottom. As a result, the height profile exhibits cusps as shown in the schematic (Figure 4). The fidelity of the molding can be verified by comparing Wra/Wma and Hmp/Hrp in Figure 4, where Wra and Wma are the apparent width of crests measured at the same depth (d) from their top surface in the molded and master gratings respectively; Hrp and Hmp are the depths of the cusps in the corresponding height profiles. The equality of Wra/Wma and Hmp/Hrp measures the truthfulness of the replication. It is noteworthy that the original widths, Wro and Wmo, of the crests on the molded and master gratings need not to be measured directly to test the fidelity of the molding. Based on the measured height profiles shown in Figure 3, both Hmp/ H (15 nm/10 nm) and Wra/Wma (84 nm/ 56 nm) are calculated to be 1.5, supporting the high fidelity of the molding technique quantitatively. Thus, AFM images suffering from systematic artifacts can even provide sufficient information to analyze the sample surface texture without any ambiguity. High fidelity of a nanomolding process has been reported successively with the help of AFM measurement while the AFM image itself suffers from the systematic artifacts originated from the finite size of the AFM tip. Although the tip dimension is larger than that of the nanostructure under scanning; it is still able to provide the accurate information required to reveal the high fidelity of the nanomolding process. Thus, proper analysis of AFM image is the key issue to avail the information of nanostructures without unnecessary surface characterization techniques (e.g. SEM). AFM are being used on regular basis by the increasing number of researchers with the advent of nanotechnology and its applications in various fields – from biological research to space research [17,18]. It is therefore necessary to have a basic understanding to interpret the AFM images otherwise it might lead to an erroneous conclusion of the research work. The work presented in this letter is of paramount importance to the researchers working with AFM for nano-structure characterizations to analyze the data accurately. The experimental work was performed in Institute of Atomic and Molecular Sciences, Academia Sinica, Taiwan. Barth JB, et al. Engineering atomic and molecular nanostructures at surfaces. Nature 2005;437:671-679. Quake SR and Scherer A. From micro- to nanofabrication with soft materials. Science 2000;290:1536-1540. Xia Y, et al. Unconventional Methods for Fabricating and Patterning Nanostructures. Chem Rev1999;99:1823-1848. Guo LJ. Nanoimprint lithography: Methods and material requirements. Adv Materials 2007;19:495-513. Gleiter H. Nanostructured materials: basic concepts and microstructure. Acta Mater2000;48:1-29. Ghamsari MS and Bahramian AR. High transparent sol–gel derived nanostructured TiO2 thin film. Mater Lett 2008;62:361-364. Biring S, et al.High speed fabrication of aluminum nanostructures with 10 nm spatial resolution by electrochemical replication. Nanotechnology 2008;19. Biring S, et al. Electrochemically replicated smooth aluminum foils for anodic alumina nanochannel arrays. Nanotechnology 2007;19:015304. Mueller DJ and Dufrene YF. Atomic force microscopy as a multifunctional molecular toolbox in nanobiotechnology. Nature Nanotechnology 2008;3:261. Giessibl FJ. Advances in atomic force microscopy. Rev Mod Phys 2003;75:949. Sarid D. Scanning Force Microscopy: With Applications to Electric, Magnetic, and atomic forces. Oxford University Press on Demand 1994;5. Binnig G, et al. Atomic Force Microscope. Phys Rev Lett 1986;56:930. Engel A and Mueller DJ. Observing single biomolecules at work with the atomic force microscope. Nat Struct Bio 2000;7:715. Akamine S, et al. Improved atomic force microscope images using microcantilevers with sharp tips.ApplPhysLett 1990;57:316-318. Martin GL, et al. Motor proteins at work for nanotechnology. Science 2007 317;333-336. Mamalis AG.Recent advances in nanotechnology. J MaterProcess Technol2007;181:52-58.